TanzaniaInvest had the pleasure of interviewing Col. (Retd.) 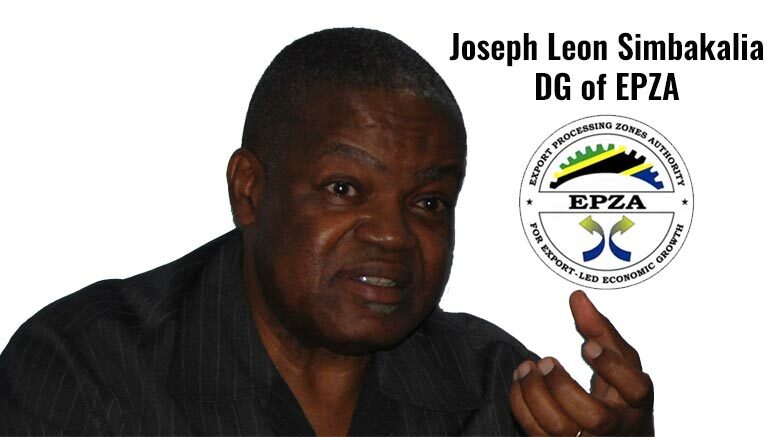 Joseph Leon Simbakalia, Director General, Export Processing Zones Authority (EPZA). He talks about the government’s industrialization agenda, the role EPZA in bringing this industrialization agenda into fruition, and the current large industrialization projects available to investors. TanzaniaInvest (TI): You have recently returned from a road show in China. What are your expectations on China’s role in the industrialization of Tanzania? Joseph Leon Simbakalia (JLS): We recently went to China to meet with prospective investors, financiers, and government officials, to invite them to develop industries in Tanzania. The meeting was under the auspices of the Forum for Cooperation between Africa and China (FOCAC) that took place in December 2015, where China pledged USD60bn in grants, concessional and commercial loans. Tanzania has ambitions for rapid industrialization, while China is looking to establish industries offshore., into low-cost labor areas. So, we want to capitalize on that and create a platform for world-class trade and logistics hubs that will attract industries. These will process the raw materials, and then export value-added products to feed distribution centers. For this to take place, we have to attract more investment, develop further and larger industrial projects. This is why at EPZA, we are moving away from small Export Processing Zones (EPZs) and Special Economic Zones (SEZs) to the development of larger industrial projects. TI: What are the largest industrial projects that you are currently developing and which are open to investors? The Bagamoyo SEZ, 75 kilometres north of Dar-es-Salaam, which is going to be run by the Tanzanian Government with China Holdings Limited and the State General Reserve Fund of Oman. This satellite town will include Development of Industrial Parks, Trade Parks, Technological Parks, Tourism Industry, Real Estates, Logistics Centers, Financial Institutions as well as the construction of an Airport and Port. The Tungi SEZ in Morogoro, in Eastern Tanzania, 170 kilometres west of Dar es Salaam, a 10,000 hectares SEZ Project developed with 100% private financing from Tanzania and Singapore. Tungi is the largest industrial, commercial and Residential development project under SEZ Investment Scheme developer by the private sector. The Mtwara Freeport Zone, a 110 hectares area to service companies engaging in oil and gas exploration in the Mtwara region. This project is also developed by private financing. TI: What are the incentives that EPZA gives to investors coming to the SEZs and EPZs? JLS: Fiscal incentives are provided to reduce the financial risks. These include tax reliefs and tax allowances for 10 years to allow for recouping of investments. But we also provide non-fiscal incentives i.e. infrastructural support such as access to water, roads, and electricity. In addition, the Tanzanian Government can provide ad-hoc fiscal incentives for particular investment with high financial risk to make the project bankable and commercially sustainable. TI: All in all, why invest in Tanzania? JLS: Anyone looking to invest in Africa should look first at Tanzania because it has a lot of potential for development, combined with a track record of 50 years of political stability. Tanzania is also the only country in Africa that integrates the East African Community (EAC) and the Southern African Development Community (SADC). Tanzania faces the Indian Ocean, which is the only barrier to the Asia markets. Tanzania is strongly focused on achieving its industrialization and development goals, and I believe the current government is able to mobilize the country’s resources to achieve that. I strongly recommend investors to look at www.TanzaniaInvest.com to get updates about our country and the numerous investment opportunities available.